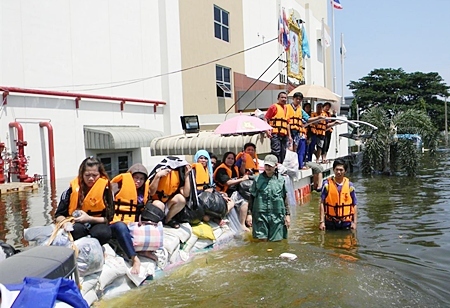 Volunteers from Pattaya’s Sawang Boriboon Foundation joined flood-relief efforts in Bangkok and central Thailand, aiming to lend much needed help to hard-hit Sawang organizations there. 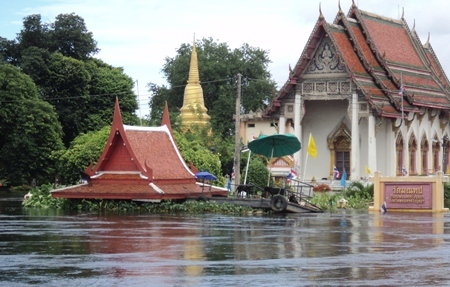 Sawang Boriboon President Prasit Thongthidcharoen and Vice President Chusri Sirisutwenpan reviewed the organizations efforts in Ayutthaya, Pathum Thani, and Bangkok’s Nava Nakorn and Rangsit districts at an Oct. 25 slideshow in Pattaya. 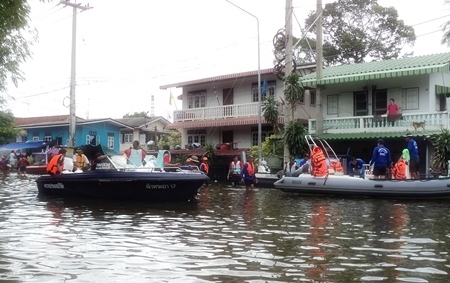 The Pattaya volunteers joined Sawang personnel from Phaisal, Katanuu, Sanphet and Rattanatrai, using boats to distribute relief packages in inundated areas. 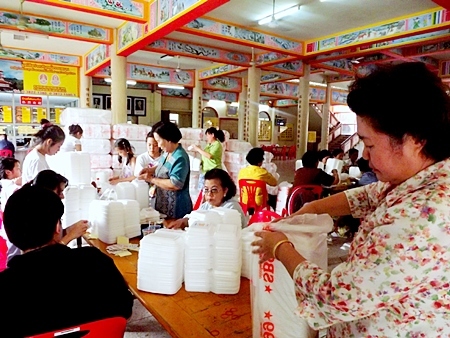 Volunteer spirit – Sawang Boriboon Pattaya Foundation members and friends pack relief supplies. 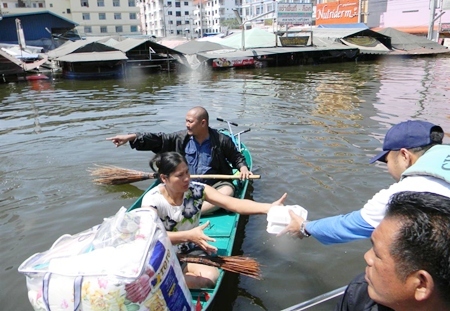 The organization rotated teams of six-to-seven volunteers to hand out 1,000 packages containing canned food, medicine and drinking water to flood victims. 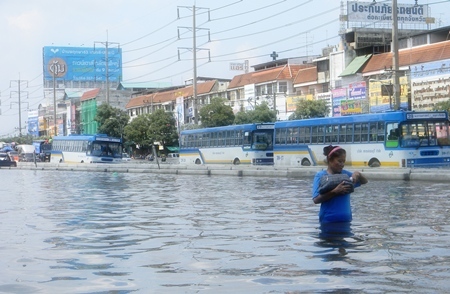 Prasit said the 300 volunteers faced arduous, obstacle-filled conditions getting to victims through standing water and helping the government’s Flood Relief Center evacuate them to shelters and hospitals. 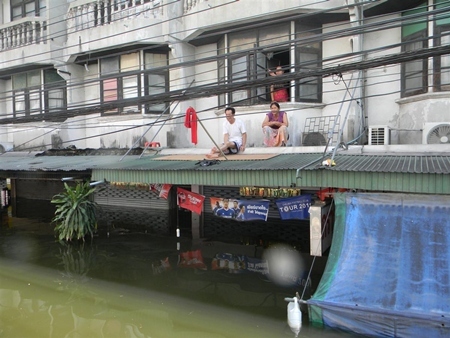 Dykes on the Rapipat canal breached in three places, causing water in the Chulalongkorn canal to rise by 7 cm daily. 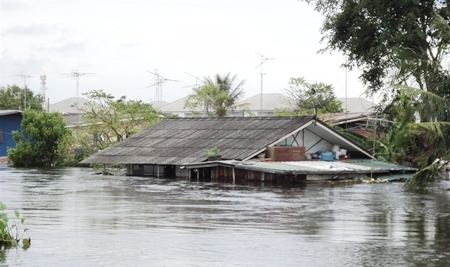 Sandbags have been piled high and at the time they were there, were still at least 10 cm above the water level. 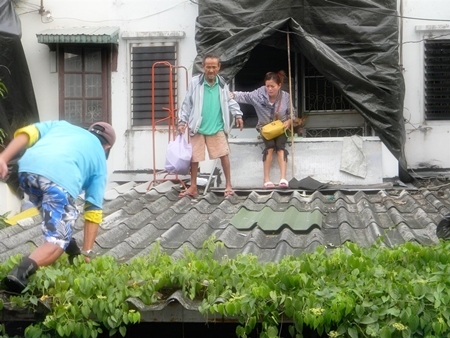 Sawang Boriboon workers rescue people from the rooftops in Ayuthaya. 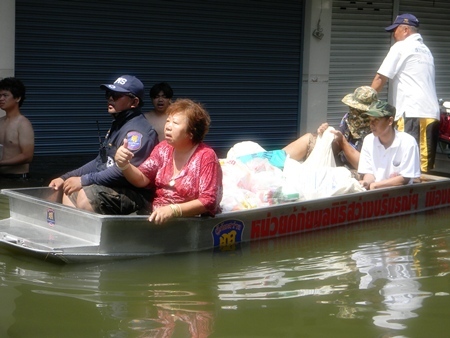 Thailand’s floods had claimed over 370 lives and affected 62 provinces, 628 districts, and 2.9 million households and 9.4 million people. 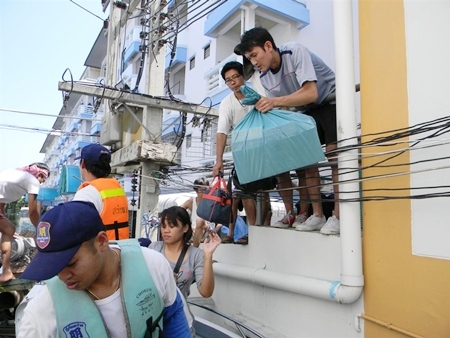 Chusri said volunteers packed the 1,000 care packages locally, with Bangkok Hospital Pattaya donating seven large boxes of medicine for a planned delivery at Rong Klua Market Nov. 1. 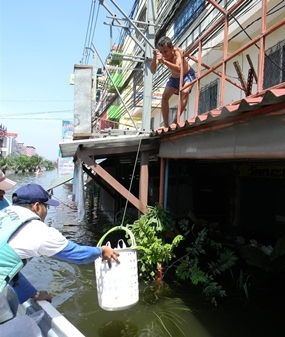 While much of the attention has shifted to Bangkok, Sawang Boriboon personnel continued to work in Ayutthaya, the epicenter of the flooding crisis. 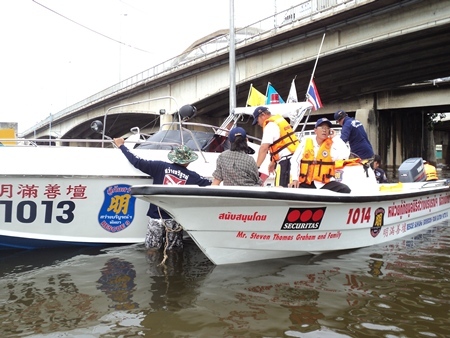 The foundation sent four boats, two of which were donated by the Pattaya Relief Group headed by Steve Graham, MD of Securitas Thailand, with five volunteers each into the flood plain Oct. 17-21, evacuating more than 1,000 patients from Ayutthaya Hospital. 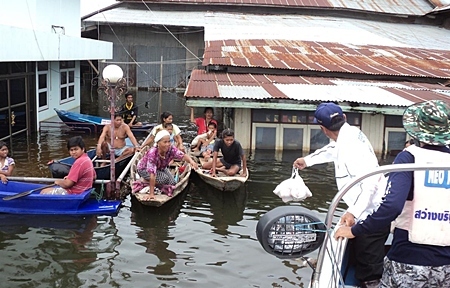 They also distributed 3,000 relief packages per day, as well as medicine and drinking water. 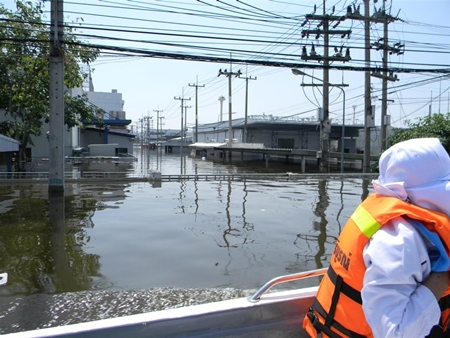 Prasit said the high water and lack of electricity were significant obstacles to the evacuation, as several patients required respirators. 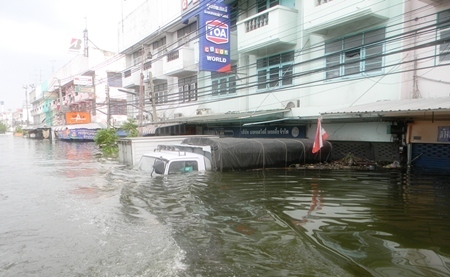 All photos on this page were supplied by Pattaya’s Sawang Boriboon Foundation. 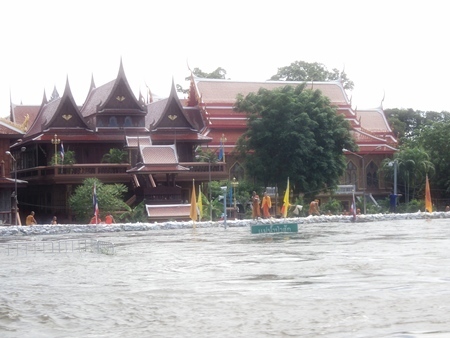 Flood waters up to the rooftops in Ayuthaya. 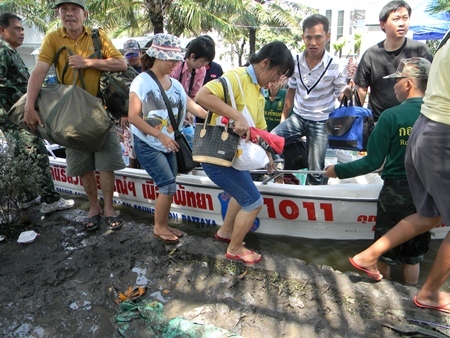 People make their way to the evacuation centre in Ayuthaya, Preedee Bridge, any way they can. 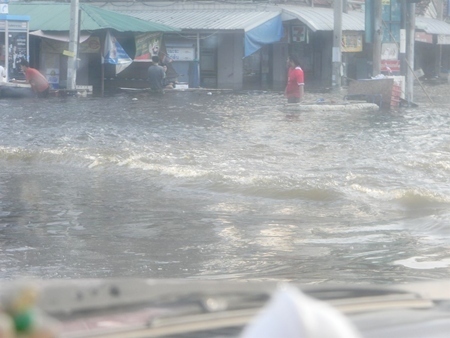 If the supply routes are flooded, and transportation under water, there is no way to get supplies to other places in Thailand, too. 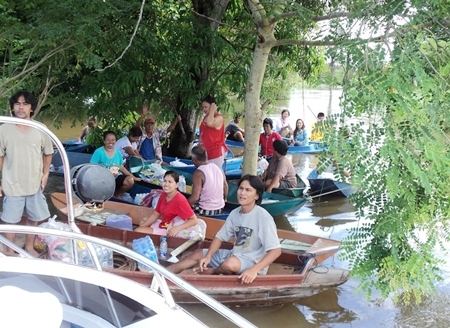 Escaping from the midday sun by rafting together under the shade of trees in flood stricken in Ayuthaya province. Sit tight, we’ll be back as soon as we can. 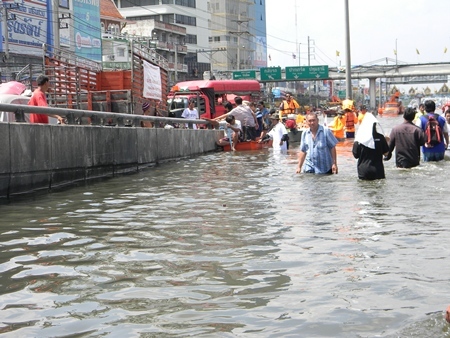 It’s no wonder people are parking their cars up on bridges in Bangkok. 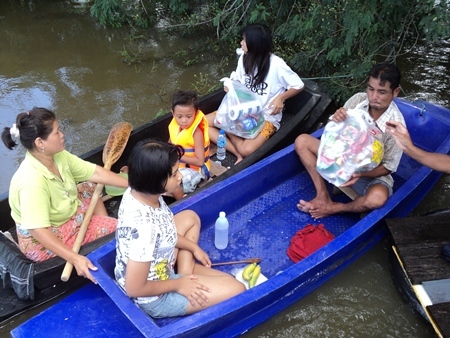 People evacuate their homes and businesses in Saraburi, under the u-turn bridge. 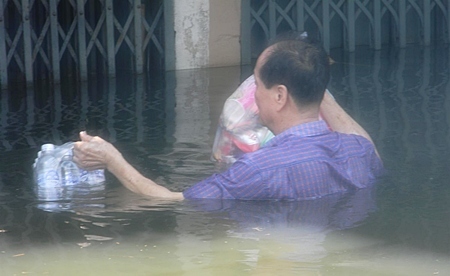 Sandbags didn’t keep the flood waters out of this factory, but they do supply a somewhat dry spot for people to use whilst waiting to be rescued. 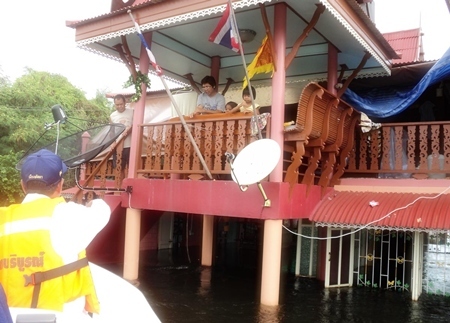 Flood waters shut down everything in Nava Nakorn. 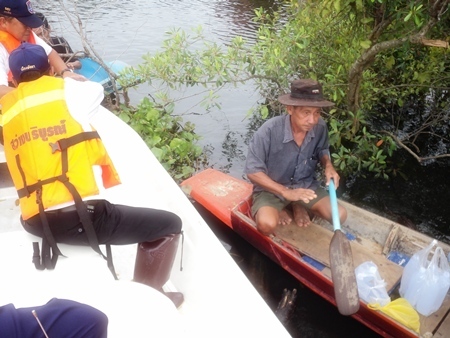 This old fellow needs a bit of help, and tells workers he’s never seen anything like this in Nava Nakorn in all the years of his life. 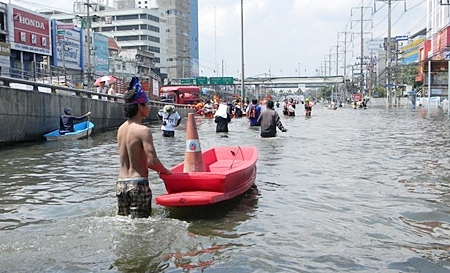 Emergency supplies help this man wait out the flooding in Bangkok. 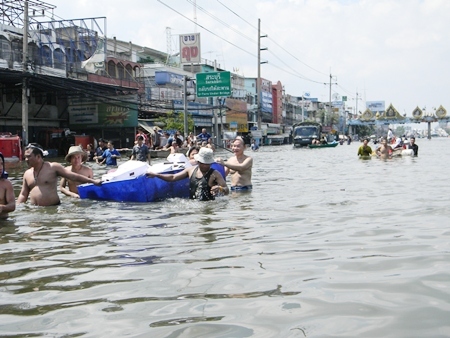 People slowly make their way towards safety in Bangkok. 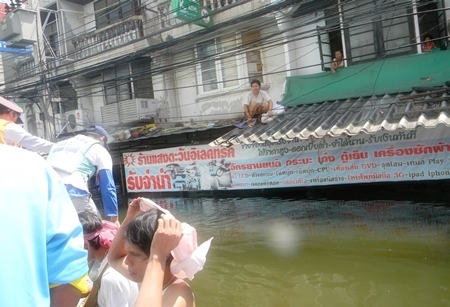 Members of the Sawang Boriboon Foundation evacuate people from upper floors in Nava Nakorn. 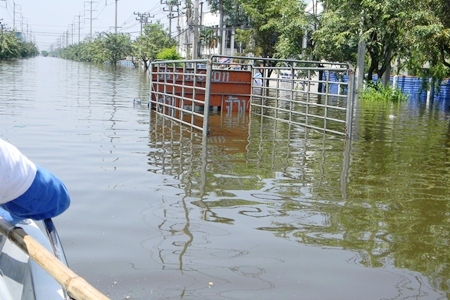 Industrial estates in Nava Nakorn have shut down due to flooding. 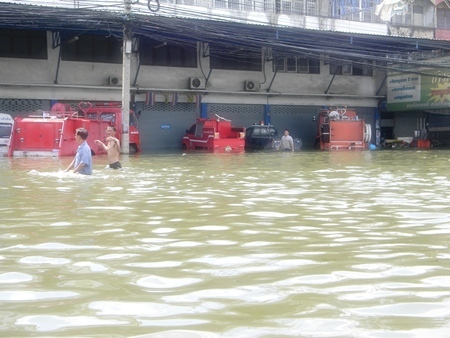 Small markets in Nava Nakorn are completely submerged, too. 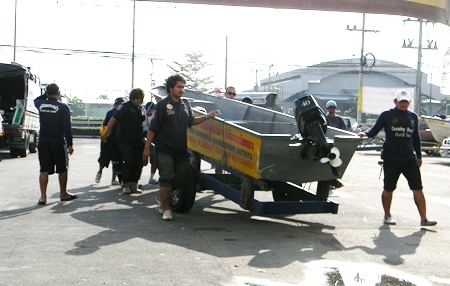 These two vendors are extremely happy to receive a meal from Pattaya’s Sawang Boriboon Foundation. 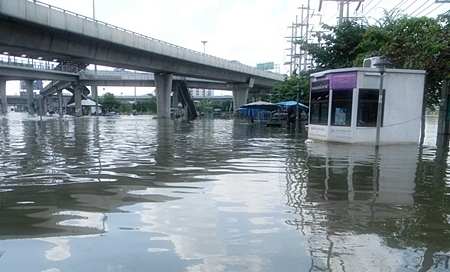 Flood waters rage in the outskirts of Bangkok. 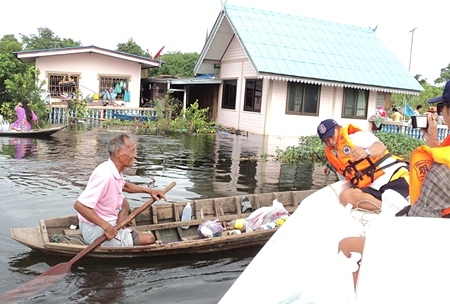 Sawang Boriboon Foundation volunteers evacuate people from rooftops in Nava Nakorn. Many have to find creative ways to receive emergency packages. 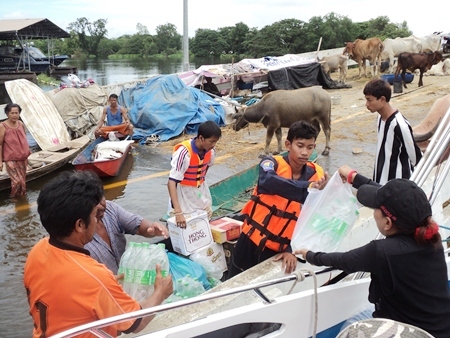 Emergency liquids are delivered in Ayuthaya. 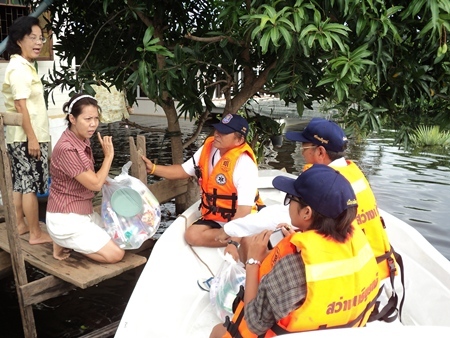 Families reach out for rescue supplies in Ayuthaya.